It is a great joy to pray with you. I am honored to preach with my dear colleagues. I’ve come to believe that ecumenical awkwardness is a spiritual discipline. For the sake of the unity of the Church, we are called to go to places we don’t know, pray with people we don’t know and worship in ways that are unfamiliar. I’m from a different tradition, so if you want to help me feel at home, I invite you to try something new as well- talk back to me a little. In my tradition, we hold the preached word in high regard, but also know that a sermon is a participatory activity- it doesn’t preach if you don’t participate. And you talking back to me helps me know you are awake. If I say something that sounds right, you can “Amen” or “yes, preacher!” Try it with me, will you say “Amen!” and if I’m struggling, you can say “Help her Holy Spirit!” and if I go on too long, you can say “Make it plain, preacher!” and I’ll know its time to end the sermon. Amen? I’ve been thinking a lot about potatoes. Yes, potatoes. The starchy plain root whose blight caused so many of our ancestors to flee Ireland. See, I received many, many potatoes in my Community Supported Agriculture farm share late this fall, more than I could eat at one time. They were supposed to last me all winter. I rented a car, drove out from my apartment in Boston to a farm in Lincoln and picked up a box of vegetables grown on the nearby farm. The barn was cold, the day bright. The potatoes were still covered in the dry dust of the land. They still smelled of the earth they grew beneath. They felt chalky and dry in my hand, but the potatoes were still firm and dense. In order to keep the potatoes from rotting through the winter, the farmers instructed me to store them in a cool, dry place, and keep that coating of dirt on them. Don’t clean them until you are ready to use them, she said. This is how to preserve them for the long winter. Will you pray with me? Lord, Send your Holy Spirit to be with us as we come to your Word together. Make your presence felt in this place. Enlighten our understanding and illumine our lives. Bind us to you and one another. May the words of my mouth and the meditations of all our hearts together be acceptable in your sight, my rock and my redeemer. Amen. “We will not all die, but we will be changed.” Amidst a divided church in Corinth, Paul turns the people to look again into the empty tomb. The resurrection is at the heart of Christian faith. The Swiss Reformed theologian Karl Barth puts it this way: “Into the middle of all the illnesses and natural catastrophes; all the wars and revolutions; the peace treaties and the violations of peace; into all the progress; stagnation, and regress, into all the deserved and undeserved human misery, it happened in his time that he revealed himself as who he was, is, and will be: “Peace be with you” (John 20:21). What happened on that day became, was, and remained the center around which everything else moves. For everything lasts its time, but the love of God- which was at work and was expressed in the resurrection of Jesus Christ from the dead- lasts forever. Because this event took place, there is no reason to despair, and even when we read the newspaper with all its confusing and frightening news, there is ever reason to hope.” It’s not so much that the Corinthians doubt the resurrection of Jesus Christ, but they’ve lost a reason to hope. They doubt that they themselves would be raised. They look down at these mortal bodies and can’t see how their perishable bodies will become imperishable. They can’t hear the trumpet announcing the death-defying power of God. They can’t imagine how their mortality will be bound up in Christ’s immortality. They can’t sing Alleluia. When the Methodist hymn writer Charles Wesley turns to this theme in 1730’s and writes the lyrics to the Easter hymn “Christ the Lord is Risen Today,” Wesley writes (sing)“Made like Him, like Him we rise.” The Corinthian Christians can claim Christ’s resurrection, but they can’t claim their own. Christ will rise, but us? We’re not so sure about that. They can’t imagine that they will be changed. It’s easy to empathize with the Corinthian Church- that familiar sense of feeling stuck as they are, of looking out into the current situation with trenches so deep and worn that there seems no way to move to a new path. Paul is asking them to believe, to try imagining something new, something that totally reorients all of their previous divisions. The call to unity in the body of Christ has always been a renewal movement in the Church. Remember who we are, Remember our Lord is undivided. Remember, one faith, one Lord, one Baptism. Believe in the resurrection of Christ and the Lord’s power to resurrect us too. Believe that we are “made like Him,” and “like Him we rise.” Now, using the command form or demanding that someone believe is about as logical as shouting at someone to be quiet. But Paul does more than shout “believe,” he invites the Corinthian Christians to try on this new belief. Look at that verb in verse 53 (the Protestant in me wants you to pull out your pew Bibles and follow along), “For this perishable body must put on imperishability, and this mortal body must put on immortality.” That Greek verb “put on” or translated another way “slipped into” can carry a connotation of putting on clothing. Wrap yourself in a heavenly garment, put on a robe of imperishability. Try on this idea of resurrection until it feels like your own skin. Paul invites the doubting Christians to try on the belief that God can take perishable and mortal things and change them. The ecumenical movement will shrivel and perish without a compelling vision of the unity that is possible in Christ Jesus. Try on the idea of reconciliation between God and one another. Imagine the day of feasting at the Lord’s Table together. Dream of the day when this service has a common Eucharist. Imagine the possibility of reconciling our divided ministries and divided churches. Try on the belief that God untangles intractable situations. Slip on the possibility that our victory in Christ comes not at the expense of one another. The Lord can resurrect Christ Jesus from the dead; surely the Lord can transform our seemingly intractable divisions. Church, can someone say Amen? 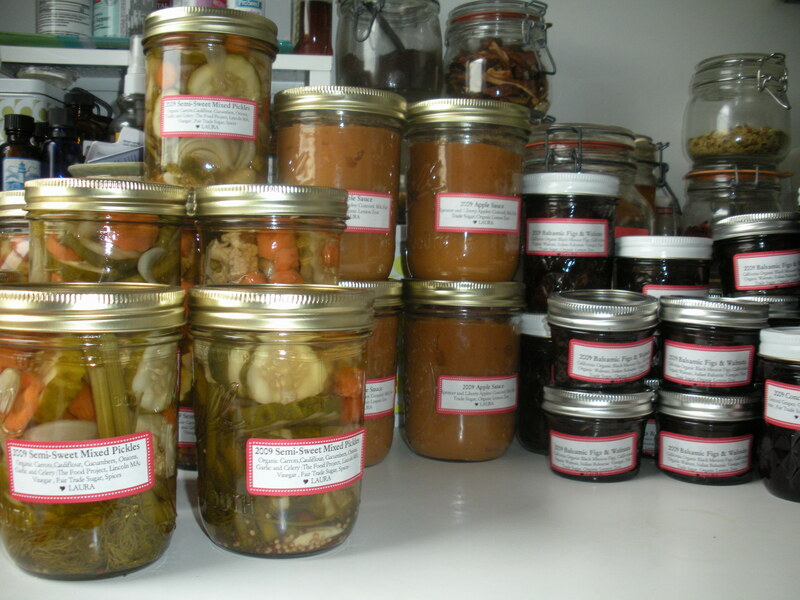 The first year I learned to can vegetables, I only knew how to preserve one way. And so I preserved 30 jars of pickles. Which is fine if you eat 30 jars of pickles in a year, but most people don’t. I gave many jars away, but woman cannot live on pickles alone. The next year I learned to can pickles and tomatoes. Sometimes the Church looks at the storehouse of things we’ve preserved and realizes that we’ve got shelves and shelves of pickles, and no peach jam. The Anglican Church historian Phyllis Tickle in her book “The Great Emergence” surmises that every 500 years Western church goes through a seismic shift, a shift that we are in right now. She says its like the Church has a giant rummage sale; we pull everything out of the attic, puts it on the front lawn and asks “What do we keep? What do we save? What did we forget was here and can use anew?” In the Protestant churches, this is definitely a time of reassessing what of our storehouse has perished, what has been gloriously preserved and what we need to plant again. I’d love to hear if you sense the same shifting and changing in your church community. There’s much anxiety in this time of emergence. There is much pain in throwing out things that have perished. There is much grieving over that which is lost. But we are a people of the Resurrection. I believe God will resurrect us and our churches. We will not all die, but we will be changed. My friend Liz, an Evangelicalish Episcopalianish Christian, is a farmer on the North Shore, farming on land that has been worked since 1640. She told me about the ideal mix in the soil. We want soil with a three-part mix of the “living,” like the root of a growing potato plant, the “recently dead,” like the vines and leaves of the tomato plant you just tilled under after picking all the fruit, and the “very dead,” like the fully decomposed compost. That is the setting where real growth can occur; the living, the recently dead and the very dead. That’s the ideal condition. But New England soil is tough. Liz says that New England soil is best at growing rocks. The setting that we tend our churches in is perhaps less than ideal, but this is where God has planted us. But the stress is beginning to show in ways that are unfruitful in our own communities and in our hope for Christian unity. When plants are under stress, perhaps because the conditions are too hot in the field, they fear that they are going to die and they ‘bolt.’ The head of lettuce shoots up a giant stalk, flowers and goes to seed. The plant itself becomes inedible. All of the energy of the plant goes into self-preservation and the leaves become bitter. I wonder if that’s where are churches are? The anxiety level is running high. There’s a sense that things are changing too quickly and too dramatically. The focus is self-preservation. We stop interaction with other churches, leaving ecumenism as something optional at best and outsourced at worst. We turn inward. And our fruit becomes self-referential, small, and bitter. Christian unity is the counter-measure to our own insularity that produces bitter fruit. Jesus prayed that his followers might be one not for their own sake, but for the sake of the world. The victory through our Lord Jesus Christ that Paul speaks of is not a Presbyterian victory, or a Roman Catholic victory or an Orthodox victory. Ours is a victory of resurrection in which we will all be changed, Praise God! Changed from seeds planted in the rocky New England soil. “We will not all die, but we will be changed.” Next, together we will say the Apostles’ Creed. We will confess what we know to be true. We will say, “I believe in the resurrection of the body and the life everlasting.” Try it on. Try on resurrection, even if you don’t believe it today. Put on the conviction that we are made like Him and like Him we will rise together. Slip into that heavenly robe that holds out the possibility that God might change us and might change this divided Church. May it be so, Amen.